Lewisburg resident Mark Bowe's life took an unexpected turn in 2014 with the success of his television show Barnwood Builders, which airs on the DIY and GMC networks. On the surface the show is about a crew that rescues 150-year-old cabins and barns, so they can be repurposed as high quality, eye-catching contemporary homes and public buildings. Just below the surface it's about some old-fashioned virtues: hard work, perseverance, kindness and friendship. As the show enters its third season, Bowe finds himself adjusting to the challenge of being recognized by fans from near and far as he tries to maintain a semblance of normal family life in the Greenbrier Valley with his wife Cindy and their son Atticus. A Glasgow, West Virginia native and WVU graduate, Mark began his professional life as a mine safety technician. 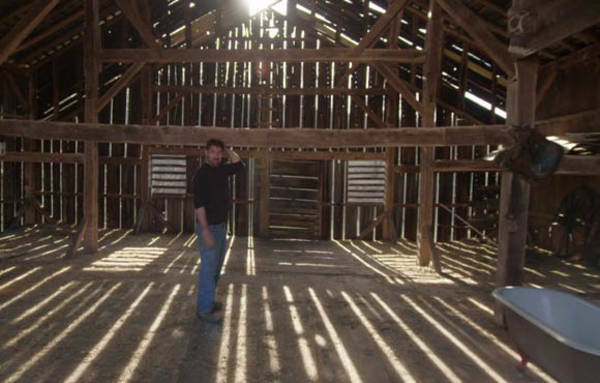 His entrepreneurial instincts began stirring, and in 1996 -- after helping a friend tear down an old barn -- he launched Antique Cabins and Barns. The business led to a chance encounter with a documentary filmmaker, and eventually his TV show which stars the same quirky, loveable, talented crew that has been working with him for years. The Bowes moved to Lewisburg in 2001 and have been a part of the community’s fabric ever since. In addition to Antique Cabins and Barns, Mark owns an insurance business and served a term on the City Council. Cindy, a natural organizer, was instrumental in launching the United Way’s Chocolate Festival, which draws thousands to the area every spring. We caught up with Mark when he was taking a break between shooting episodes of Barnwood Builders. We asked him to share a little about his journey from coal miner to TV personality, and how he relaxes when he's not so busy. Q. Besides being the crew boss on the show, what role do you play behind the scenes? A. This is our third season, and I'm one of the producers now. I manage the guys, and I help put the show together. Every show has a story arc that I help develop. I tell the producers about the families we're working with, the crafts we'll be demonstrating, and when the challenging parts are coming up. We usually include a segment with a local craftsman. I help locate them and go out on the visits. I also write the epilogue at the end of each show that sums up what you've just watched. Q. What would you like to accomplish with Barnwood Builders? A. Besides providing for my family, I want to champion West Virginia. I'd like to change the stereotype of the word "hillbilly." The network wouldn't let us use it the first season, but then truck drivers would be making deliveries to us and proudly identifying themselves as hillbillies. The network came around. I think it means strong ties to family and friends, a willingness to do hard work, and things like perseverance and fortitude. Q. What attracted you to Greenbrier County? A. Cindy and I came down for a couple of weekends in 2001 and we discovered that everything we wanted was here. It became a question of why we weren't living in Lewisburg. Besides being a good fit with our lifestyle, it's a great place to entertain clients. I had an office downtown, and my clients would fly in from all over the country. We'd take them to lunch or dinner and do whatever was happening around town, like the concerts on the lawn at Carnegie. They were always impressed. Q. You're an incredibly busy guy. When you have time for yourself and your family, what do you like to do? A. I'm an outdoors person. If there's an excuse to play outside, I do it. We kayak, canoe, fish, go camping – all the river stuff. I shoot guns and throw hatchets, too. I'm pretty good with a tomahawk! Q. You recently spoke to 700 people in the Distinguished Speakers series at WVU. What did you tell them? A. Really just three things. Work hard. Be kind. Take pride. Q. The Gospel according to Mark? For more about "Barnwood Living," CLICK HERE. Interview by Greg Johnson. Photos courtesy of Silent Crow Arts.